We leverage skills, experience, resources, and extensive crowdfunding knowledge for your best chance of a successful six to seven figure raise. There are over 150 moving parts of premiere campaigns. We have developed proprietary processes and methodology that dramatically increase your ability to succeed and raise money! We are not consultants. We execute our strategies with you, applying our process & knowledge, hands-on management, and measurement and analytics. Success is just the tip of the iceberg. 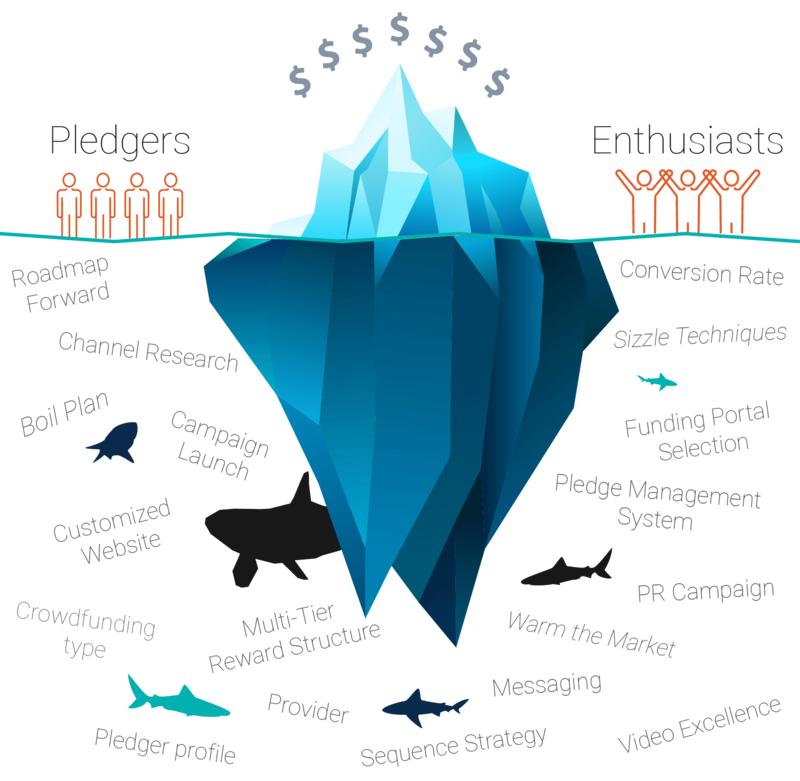 Sheer’s proven process will help your company navigate the complicated waters of crowdfunding. When building toward success, Planning & Strategies are Essential, but The Execution Is Critical! Sheer developed a business process that analyzes over 150 elements that must be seamlessly integrated into building a successful campaign. This process, The 5 Actions That Deliver™, organizes those elements into 5 manageable segments that can be customized and executed efficiently. This approach is essential to complete a large successful raise in the shortest possible timeframe. 1. Finding Your Crowd: Through deep research SHEER works to understand your crowd by analyzing their psychographics, demographics, defined audience groups, the size of your potential audience, and most specifically YOUR CUSTOMER! 2. Developing Your Story: SHEER will work to develop your story in a way that effectively engages and excites your audience. This story will then be used for all content and marketing collateral moving forward. 3. Getting Connected: Through your owned, earned, paid, and social channels, SHEER will find the most cost and time-effective way to reach your desired crowd. Videos are the primary means of communicating to the crowd. If a picture is worth a thousand words, a video is priceless…. when done correctly. Sheer has created a video strategy with proven success. The Sheer team has over 15 years experience working on writing, producing, filming, editing and posting videos. We work directly with the production team until the video best represents your product/service and company/team in a way that best excites potential pledgers. Your web presence is a primary source of information before, during and after the campaign. It is a required element in any crowdfunding campaign because it acts as a platform to drive potential pledgers to during the warm the market period, operates as a source of information during the actual campaign, and functions as a platform for retaining your customers after the campaign. When running a crowdfunding campaign, selecting a strategic posted goal and calculating how much capital is needed to be successful is critical. Therefore you must be clear in stating your goal, reward structure, use of funds, and goals beyond your posted goal (stretch goals). We help strategize these elements, the raise strategies, use of funds, rewards to offer, etc. and we measure results daily in order to help track, analyze and adjust to help exceed your goal. Sheer was one of the first to strategize a Three-Tier Reward Strategy, which has been proven to be effective in the larger raises. Through its visuals and content, the Funding Portal Pitch Page is a vital way to share the details and updates of your project and numerous other important facts about why the crowd should pledge. Once the campaign is officially launched, results must be measured immediately as the pledges come in. Adjusting and adapting on a real-time basis to improve the capital raise can make the difference in your campaign’s final raise. The moment someone pledges to your campaign they become a valued customer and it is your responsibility to engage and inform them throughout the campaign, fulfill the promised campaign reward, and develop a long-term relationship in order to maintain them as loyal customers. While Sheer has expertise in rewards crowdfunding, we also experts in the primary obstacle that businesses face today: capital raise. We have ample experience in the traditional world of venture capital and the new paradigm resulting from equity crowdfunding. Learn more and explore below.